In a monumental initiative driven by the South African Wild Dog Advisory Group (SAWAG), a founding pack of African Wild Dogs has been translocated from KwaZulu-Natal, South Africa, to Mozambique for reintroduction into Gorongosa National Park, marking the return of this species to the Park after an absence of more than 25 years, and signifying the first ever wild dog introduction into Mozambique. Through the KZN Wild Dog Advisory Group, these African Wild Dogs were relocated to Gorongosa National Park in Mozambique. This is part of the conservation strategy to re-establish a new population in the country. The efforts of the KwaZulu-Natal Wild Dog Advisory Group (KZNWAG), spearheaded by Ezemvelo KZN Wildlife (EKZNW) and supported by Wildlife ACT and EWT, have resulted in the wild dog population of this province recovering significantly in recent years, such that the KZN meta-population comprises the largest population of wild dogs outside of Kruger National Park. This success has enabled KZN conservation authorities to become key players in the redistribution of this species into its historic range. The new pack consists of a group of male wild dogs that naturally dispersed from their natal pack in the uMkhuze Section of the iSimangaliso National Park in 2016, and a number of free-roaming female wild dogs also originating from the region, that were identified by KZNWAG for this relocation. Wildlife ACT has been responsible for continuous monitoring of both groups of wild dogs. 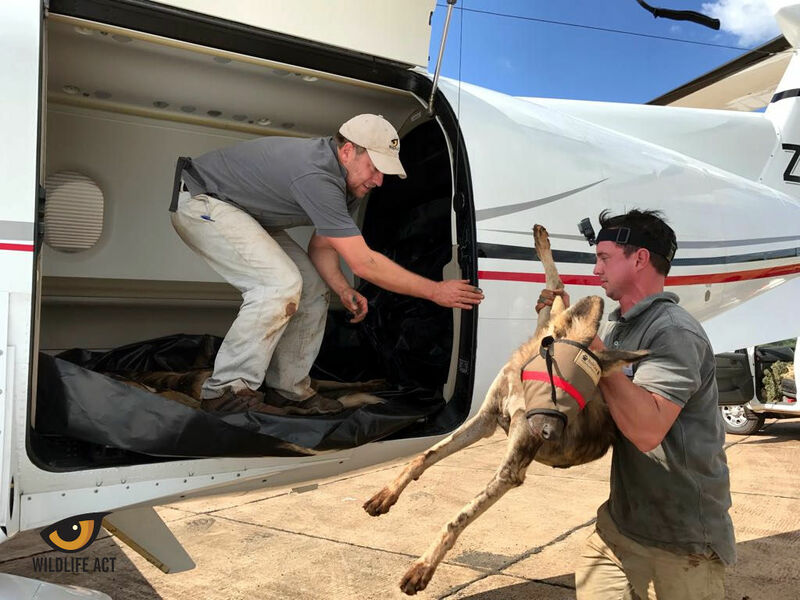 The sedated, vaccinated and collared African Wild Dogs being loaded onto the plane to be trans-located to Gorongosa National Park in Mozambique. “Wildlife ACT’s professional monitoring teams carry out the monitoring of 100% of the Wild Dog population in KZN which is approximately 60% of the national population. 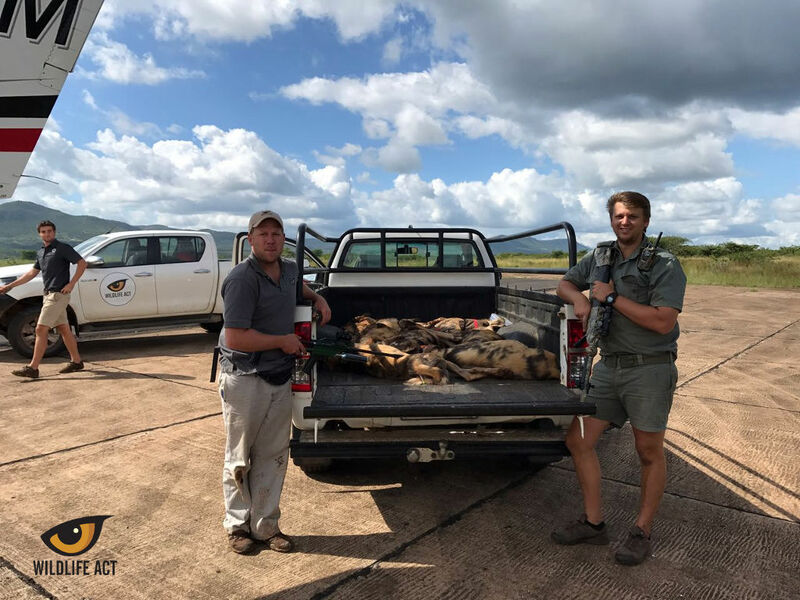 It is exciting to see these two groups, including the uMkhuze males which we have monitored since they were pups, being moved to form the founder pack for a new Mozambican population”, said Chris Kelly of Wildlife ACT. Ezemvelo KZN Wildlife officially donated the pack to the government of Mozambique in recognition of the value of Gorongosa National Park to conservation in the region and to the African continent as a whole. 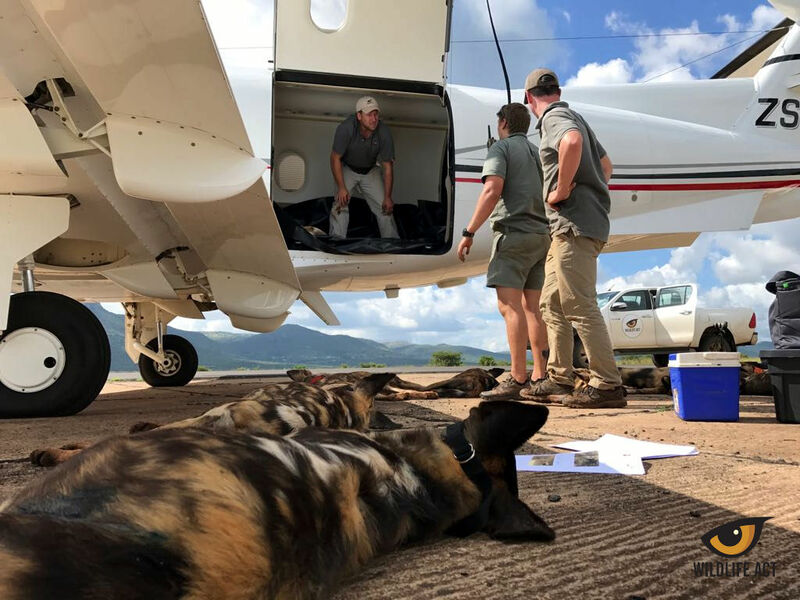 Other key partners in coordinating the transfrontier relocation were Maremani Game Reserve, the Limpopo Department of Economic Development, Environment and Tourism (LEDET) and The Bateleurs, a dedicated team of pilots who donate their time, skills and aircraft for conservation. 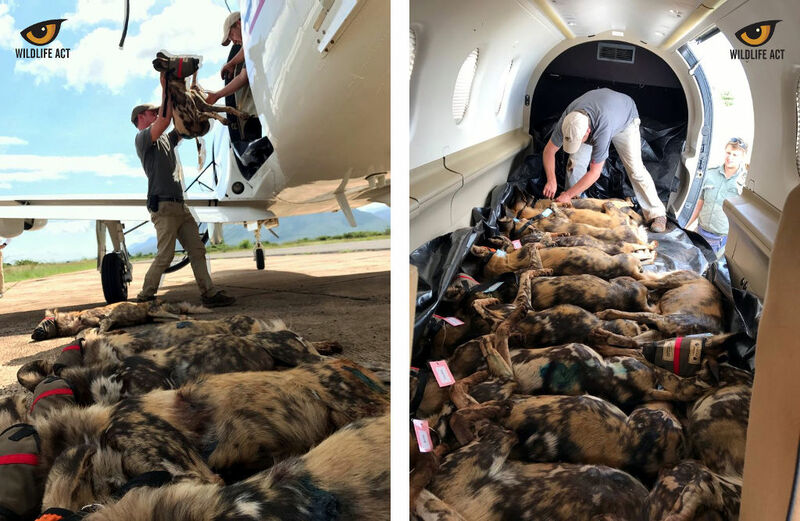 The pack, which have been temporarily held in the boma of Ezemvelo’s uPhongola Nature Reserve, were sedated and vaccinated against canine distemper and rabies before being carefully loaded onto the aircraft with a veterinarian accompanying them. They were flown from the uPhongola boma to Gorongosa by the Bateleurs, ensuring less time in transit and therefore less stress. The ongoing monitoring of the pack, once released, is critical to ensure that the dogs settle into their new habitat. To this end, Wildlife ACT has supported the operation through the sourcing of effective GPS and VHF anti-snare collars, which were fitted to the dogs while under sedation. These collars will assist the monitoring teams to track the movements of the pack as they establish themselves on the reserve. This is critical for reserve management to effectively utilise their resources in managing the pack within this key 400 000 ha wilderness area. 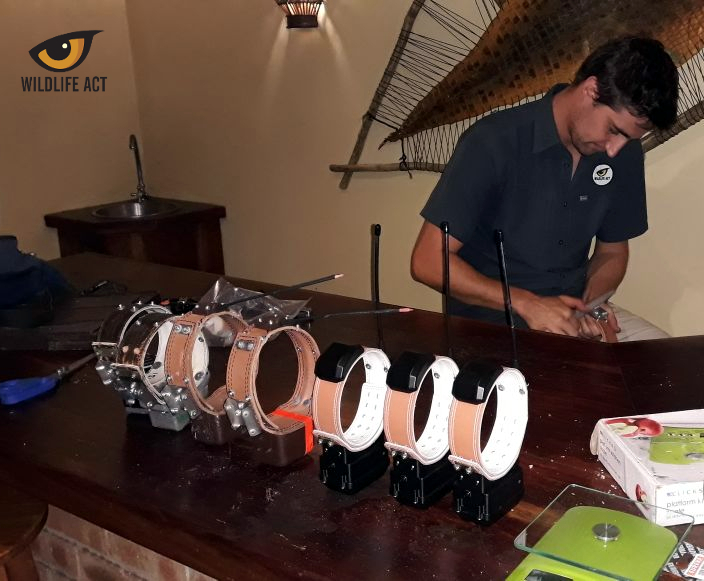 With the experience gained from monitoring the entire KZN Wild Dog population, Wildlife ACT have assisted in developing and fitting GPS and VHF anti-snare collars which will ensure effective post-release monitoring of the new pack once released.